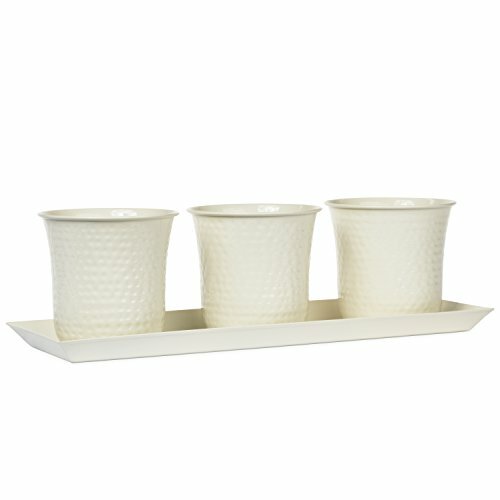 Set of three steel hand hammered planters with cream colored finish. Tray approximately 5 inches wide by 16 inches long. Each pot is approximately 4.5 inch diameter top opening, 4.5 inches high and includes a drain-hole. Indoor outdoor plant window box is Designed and Manufactured by H Potter. Professionally packaged. Set of three steel hand hammered planter with cream color powder coated finish. Tray approximately 5 inches wide by 16 inches long. Each planter is approximately 4.5 inch diameter top opening, 4.5 inches high and includes a drain-hole. Designed to hold a standard 4 inch potted plant, plants not included. Great for gifting. Perfect size for many locations.